A Shepherd's Heart: Be Still...and Know! I’ve been thinking a lot about this passage and I’ve come to realize these are two simple but very profound words that communicate volumes! With the activities of life and hurried fast paced lives we often live, we don’t do the “Be Still” principle very well. Think about it, when was the last time you and I just allowed ourselves to even physically…BE STILL? I bet if you’re ever able to get yourself to a place in your schedule where you could be still, it felt very foreign to you for a bit or you felt like you should be doing something because by all means it’s all about “our strength” or “pulling ourselves up by the boot straps”?! We we’re supposed to be self-reliant and not need anyone’s help, right? Well, that may be what the world around us tells us but that way of operating doesn’t hold water to what God tells us we need to do. Being still requires faith. Being still requires trust. Being still requires hope. …A Faith that… God has you covered no matter what. …A Trust that… He is God and He already has a plan in the works to meet you where you are according to His perfect will. …A Hope that… His plan will be fulfilled in His perfect timing. Ultimately being still is more than just being physically still as it involved our mind, soul, spirit and body. When we take time to be still, we allow ourselves a few moment of time to collect ourselves and realign our focus back on God who will be exalted – especially when we operate how He instructs us to because His ways are higher than our ways and life typically works out better for us (not necessarily easier) in the long run if we do things His way. Other translations use the words “Cease Striving” and it is the same idea that we need to stop and be still. Cease trying to work to make things happen on our own strength. Cease trying to figure everything out on our own. Cease trying to be master and commander or our lives when we can’t do it all alone. No, we need to Be Still and know that He is God and…well…we are not! The “Knowing” is the second and more important part because, if we can first off get ourselves to regularly “Be Still”, then we can rest in the “and know” part knowing wholeheartedly that He is God…He has everything under control. We need to again, know He is God and we are not. It’s not that we are to shirk our responsibilities and be completely idle siting somewhere singing the proverbial “Kumbaya” or think we should “let go and let God" (because this statement tends to not take into account some of our personal responsibility but we are to cast/give all of our anxieties to Him and leave them there. See 1 Peter 5:7) because there are real things we need to do and own but it’s the reality that we need to completely rest in, be still in... Him. At the same time, we think sometimes that we’ve got it together and in the waiting we try to force God’s hand with pushing our agenda with the absence of His blessing…and in the process we will not get anywhere. Being still is also a time seeking Him so in this sense, that is an action we can and should take in the process as we can pray, study and seek Him with everything that is within us. We cannot clearly hear from Him amidst the chaos that sometimes surrounds us (or that we allow to surround us)…we need to sometimes physically escape just to be still before Him. Once you and I get into the regular habit of being still, it will become more like breathing…it will become more natural and a part of our day-to-day walk and journey. No matter what you’re facing today, be still, cease striving to do it on your own and seek Him because you know He is God. He will be exalted through your life as you are a part of the nations and He will be exalted throughout the earth. 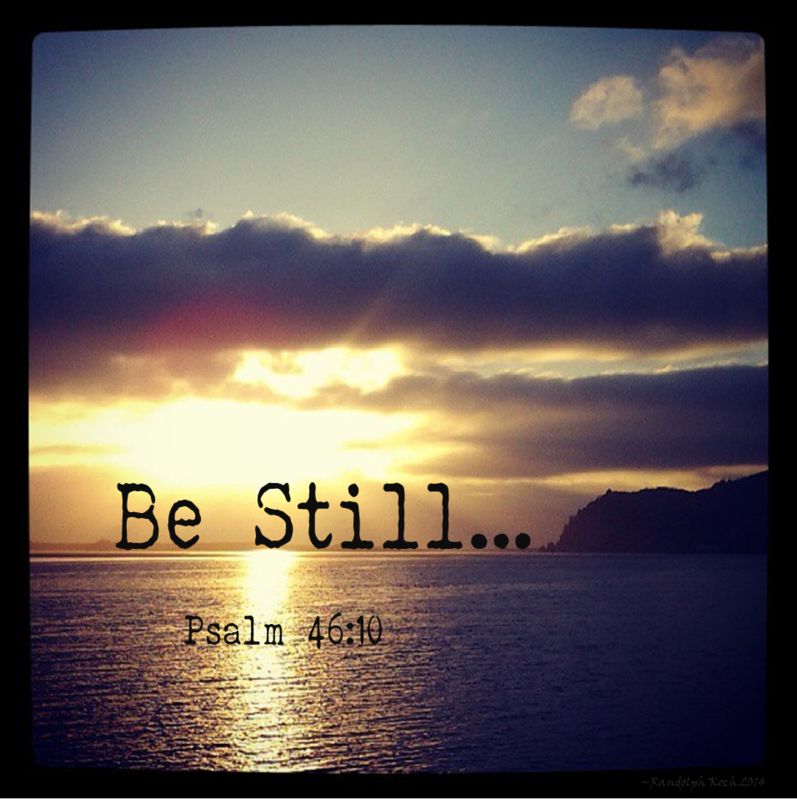 Heavenly Father, Help us to be still…and know. Help us to hold every anxious thought captive. Help us to be better at building “be still” time with you so that we may hear your voice through our times with you through prayer and your Word and through the proclamation of the Word through our local church gatherings. Help us to fight back the chaos in our life that comes our way or that we allow to be a part of it. Help us to live wholeheartedly for you walking in the truth that You alone are our strength and have it all together! Let us be your ambassadors and may we help exalt and make your name great among the nations. In Jesus Name I Pray, Amen.